Welcome to the 2017 Greensboro Shrine Club 32 Day Gun Raffle. One ticket could win you 32 Guns. Our first drawing August 15 (1 st Early Bird), then our next is September 15 (2nd Early Bird) and our 30 Day drawing starts October 1st – 30th. Each winners ticket is re-entered back into the drawing making it possible to win 32 guns. Only 600 tickets will be sold. Best of Luck and THANK YOU for supporting the Greensboro Shrine Club. Below we have photos of the weapons that will be given away to the winner and also below are the RULES that you will have to follow if you are a winner of one of these weapons. Just click on the highlighted choices below to view. To Purchase a Ticket call Tracy @ 336-707-6588 leave your name and number and someone will contact you. 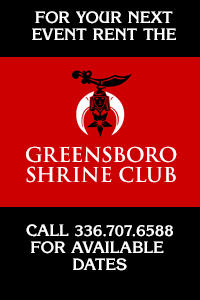 Again THANK YOU for supporting the Greensboro Shrine Club.